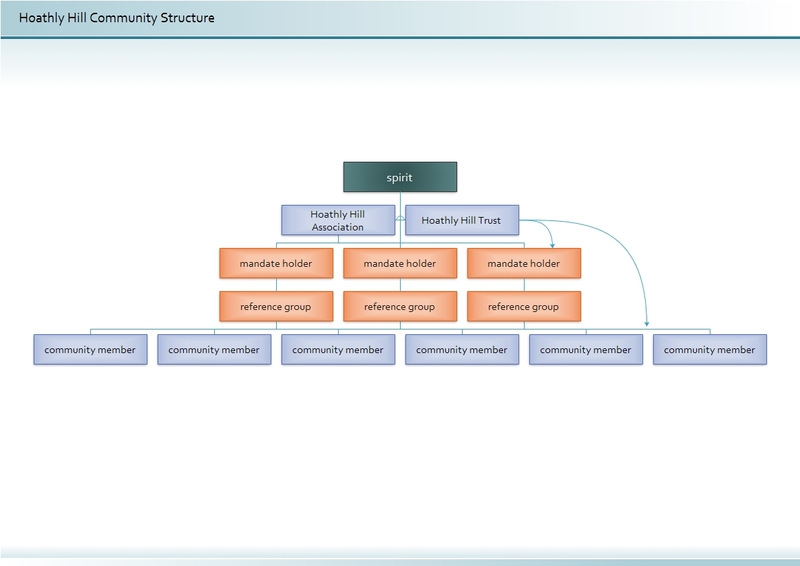 Above is an outline of the structure of Hoathly Hill Community. There are two legal entities: Hoathly Hill Association and Hoathly Hill Trust. There is a mandate system in operation. This was introduced to replace a consensus decision-making model previously used in order to facilitate decision-making. There are many ‘mandates’ for community activities: Community Meetings, Membership, Soft Landscape, Hard Landscape, Car Parks, Development, Finance, Community Buildings, Renewable Energy, Animals, The Pond, Trust Land, The Main House, The Bulletin. There are also several tasks: Insurance, Saturday Cafe, Bookings of Community Buildings, Recycling, The Greenhouse, Bees, CSA Scheme, The Herb Garden, Composting, Biodynamic Preparations. The community recommends the appointment of mandate holders to Hoathly Hill Association after a prospective mandate holder presents his terms of reference to the community meeting. Once appointed, mandate holders make decisions within their terms of reference on the basis of their perception of what is living and needed in the community. 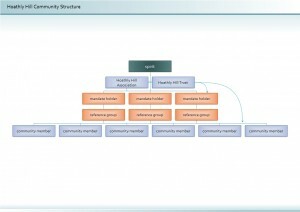 There are no procedures for decision-making other than in theory it is based on consultation with the community and connection to the higher spirit of the community. The mandate holders are responsible to Hoathly Hill Association and hold their position for a maximum of three years, although in practice up until now many have held their positions for much longer. They are also required to review their mandates every year, which is currently scheduled by the Community Meeting Mandate Holder. There has not been a review of the mandate system at Hoathly Hill for some time. Sometimes it works, sometimes it doesn’t. It works when there are quick, practical decisions to be made or when there is a good process of consultation for community views on a controversial or difficult issue. It doesn’t work when there is little or no consultation of the community. Trust in the mandate holder wanes when they fail to consult widely or have held the mandate for a long time. Sometimes community members do not consult the mandate holder in effect ignoring the mandate system. The mandate system has been developed by various people and groups. It is a common structure in Steiner Waldorf Schools. There is written work on the mandate system in Vision in Action, ed T Voors. The Barefoot Connection is a community of social change practitioners and has written about the mandate system in their Barefoot Guides.